“I love it when a plan comes together.” This is not just the line Hannibal used to say at the end of the 80’s adventure show, The A-Team. It’s also how I feel today. After months of planning, promotion, and hard work, the clothing drive that my daughter Jade Hasseman helps to organize will happen. 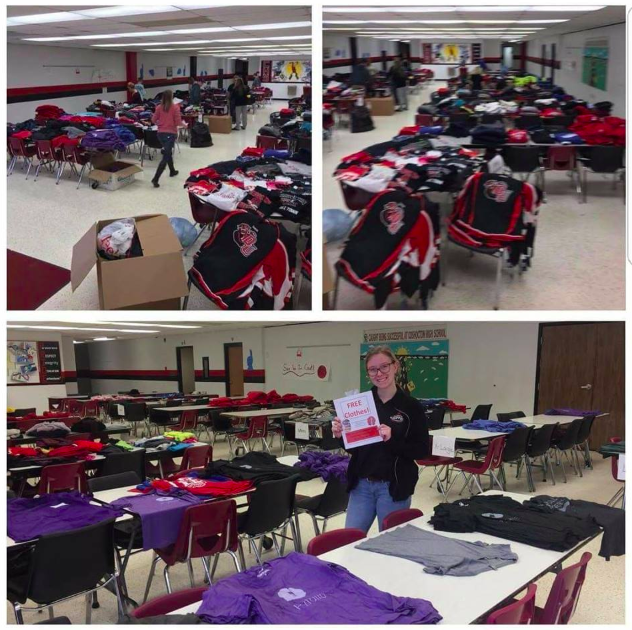 Last year, Jade saw a need at her school and decided to start a clothing drive for kids who needed warm clothes. It went incredibly well and this year they decided to do it again. (You can read more about it here). So today, (because it was too much for pick up trucks) a Box Truck full of new and gently used clothing will be heading to Coshocton High School for kids in need. They will be able to take whatever they need…for free. In addition, many generous people donated money so they could provide deodorant, shampoo, soap too. Oh, and it’s worth a shout out to Coshocton Dentistry who is donated Toothbrushes and toothpaste as well! The generosity of the Coshocton County community has been amazing. I am super proud of Jade (and my wife Amy) for helping to make this happen. But Jade would tell you it’s a huge team effort. There are tons of people that have donated, helped to sort and fold the clothing, and (hopefully) lots of people to help load up today. Any effort like this cannot happen without a large group of people that roll up their sleeves. It all started with a simple question. What can I do to help? Make sure you never miss an update! Today is a great day to sign up for our VIP newsletter here. -Everyone can take…and most people do. It takes a special person to give.- That’s why I am excited to share that my daughter, Jade Hasseman, is organizing a Clothing Drive again this year in Coshocton. You may remember that she organized one last year…and the results were amazing. I even talked about it in the DMJ podcast here. Last year, Jade saw a need at her school. Some kids simply did not have some of the basic necessities. Her idea started simple enough. She felt like her and her friends had plenty. So they could donate their extra clothing for those in need. That is wonderful…and would have been fine. But the idea took off. 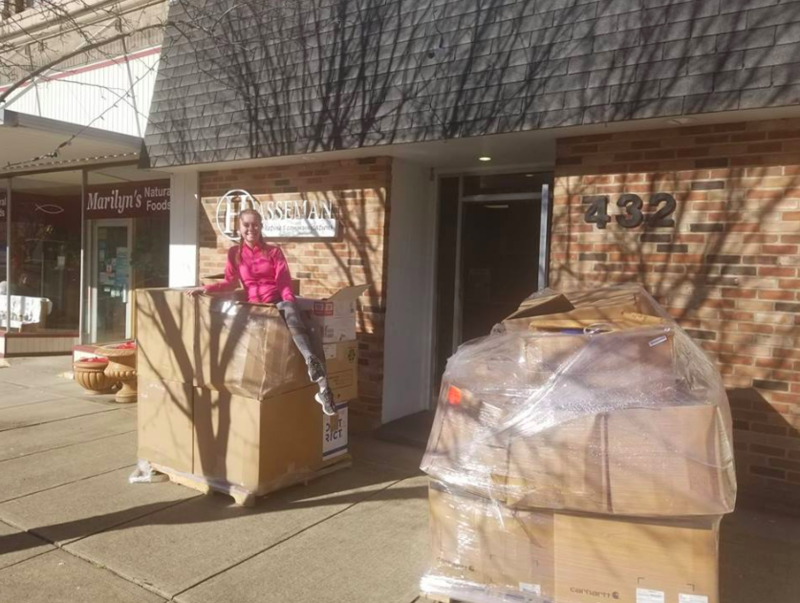 Not only did the Coshocton community step up to donate clothing off all sizes, but so did people outside of Coshocton too! It’s worth a special shout out to Andrea Debottis from Flying Colors Imprinting, who donated 2 full skids of samples for people in need. In the end, we filled the Coshocton High School cafeteria for 2 days and gave away nearly everything to families in need. It was heartwarming! So the event is happening again this year! Jade has made arrangements to partner with several other student organizations and we are soliciting donations again. How Can You Help? I am so glad you asked. There are several ways you can be a part of this cool event. 1. Clean Out Your Closet: The easiest way to help is to simply look through your closet. Find the really nice items that you no longer need, and donate them to the drive. 2. Cold Hard Cash (or checks): Jade will be accepting monetary donations so she can get some basic toiletries. We were surprised by those that did not have some of the basics last year…and we want to address that too! 3. Check with your organization: Does your organization have misprints, samples, a closet full of goodies that no one uses? If so, they would likely be perfect for this! Like I said, one of the most impactful donations came from Andrea Debottis because we were able to serve so many with her donation. Be like Andrea! Jade has created a Facebook event so you can keep on progress (you can find that here). She has set a deadline for collections ending November 2 with distribution around the first of December. But in the meantime, if you want to donate (especially those outside of Coshocton County), please reach out to us at Hasseman Marketing. We will help to coordinate the when and where. Thanks for considering. Thanks for helping. Thanks for making a difference. Want to make sure you never miss an update? Sign up for our VIP newsletter here. We want to help you make a difference every day.